Virginia ACTE Excellence Awards guidelines have been changed to align with ACTE’s new award requirements and procedures. Access Virginia ACTE’s Awards Portal page. The deadline for Virginia ACTE Member Awards is November 10. 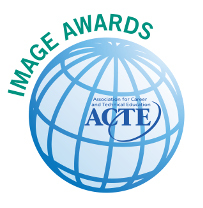 The ACTE Image Awards recognize groups and individuals from the education, business and industry communities who enhance career and technical education by contributing to the improvement, promotion, development and progress of CTE. These awards go directly to ACTE for reviewing and the deadline is May 1.